Heidi circled Friday the tenth on her Baby Animals calendar. Only FIVE days until we get to see the movie, Tristan and the Magical Toy Factory! Heidi Heckelbeck and her friends Lucy Lancaster and Bruce Bickerson had waited for it to come out for months. They must have watched the trailer a hundred times. Heidi hung her calendar back on her bulletin board and went downstairs to see if anything fun was going on. As she passed the living room, she noticed the vacuum cleaner was out. Not a good sign. Then she stepped into the kitchen and saw a mop, a bucket, and Mom standing on a step stool, scrubbing the inside of a cupboard. Oh no, Heidi thought. It must be time for the Mean Clean! The Mean Clean was Heidi’s family’s special cleanup day—and it always came without warning. During the last Mean Clean, Heidi had found a wet bathing suit in her dirty clothes pile. It had been sitting there for a whole week, and her clothes had smelled super-duper gross. She had never left her dirty clothes in a pile again. Maybe I can sneak out of here before Mom sees me, Heidi thought. She turned around and began to tiptoe out of the kitchen. But Mom already knew she was there. It was like she had eyes in the back of her head. “And where do you think you’re going?” Mom asked. Heidi moaned. This wasn’t what she’d had in mind for her Sunday afternoon. Then she remembered one of the best rules of the Mean Clean: finders keepers. Hmm, she thought. Maybe I’ll find some lost treasure under the couch cushions. “Okay,” agreed Heidi as she rolled up her sleeves. She was ready to get to work. 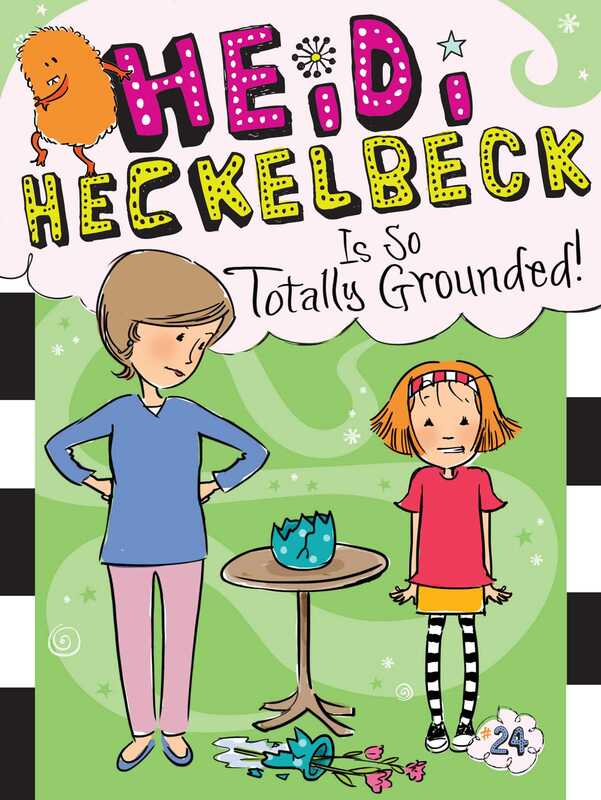 Book Cover Image (jpg): Heidi Heckelbeck Is So Totally Grounded!